Heres just a litle note about my remote setup. Today i run remote station in its absolute most simple form. It is very limited but it gives me the possibility to work radio from the TV couch or as today when I have a bad cold, from the bedroom or from work during lunch hour. The entire setup is based on free available software and a home made interface for computer control of the rig. The rig in use is my small IC-703. This limits me to use QRP but that is enough on both digital modes and CW. Rig is connected to an old laptop in the radio room via a home made CAT interface, a Digi-1 audio interface and a home made CW interface. Fixed audio out is connected via the audio interface to mic input on laptop. Speaker out from PC via interface to mic input of rig. 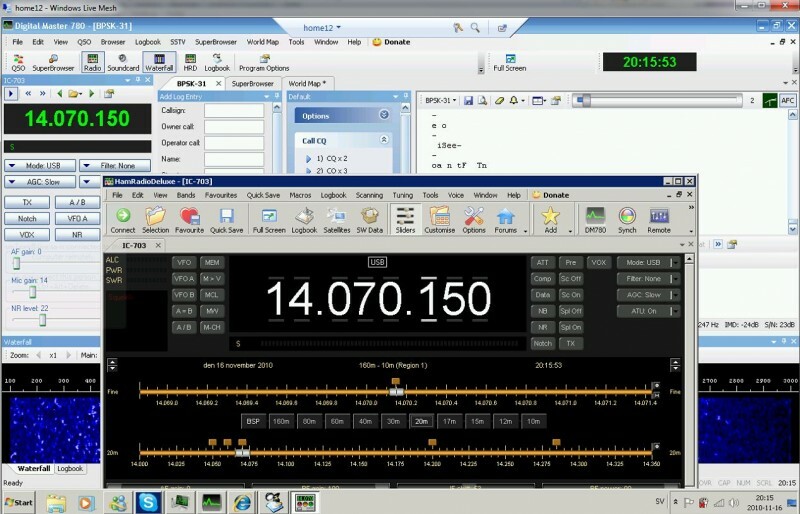 On the radio laptop I use Ham Radio Deluxe for rig control and digital modes. I also sometimes use it for logging. Main logging software otherwise is Logger32. I also use logger32 f0r sending CW. To be able to listen to the rig I use Skype. Its installed on the “radiolaptop” and is setup to auto respond to all users in adress book. That way I get the audio in good quality. For remote control of the radio laptop from other PC:s I use the new tool from Microsoft which is a part of their Live Essentials, the Live Mesh. It gives me the possibility to connect from any other laptop where i have Live Mesh installed.